ENSENADA, Baja California, Mexico —While a limited number of tickets remain in several Cinepolis theaters for this week’s three-day premieres in Mexico of Dana Brown’s long-awaited ‘Dust 2 Glory,’ three sold-out theaters in Baja California have added a second showing each night. The dynamic motorsports action documentary that was over 14 months in the making has nearly 30 select Cinepolis theaters in Mexico showing the movie this week on Tuesday, Wednesday and Thursday (January 16-18) at 7 p.m. local time. Three Baja California theaters will show it twice each of the three nights, others once each of the three days. In the Cinepolis theaters in Tijuana, Ensenada and Mexicali the demand for tickets has been so great for the premiere that those three theaters will have an additional showing at 8:10 p.m. PT each night and tickets currently remain available for all three extra showings in each city. Like the U.S. premiere, tickets may be purchased in advance on the website below. Space available, tickets may be purchased on-site at the individual theaters on the day/time of show. The version that will be shown in Mexico will be the same one that was released in the United States on Dec. 6, 2017 and the Mexico version will have Spanish sub-titles on the screen. Announced last Saturday at the 2017 SCORE World Desert Championship Awards Night in San Diego, Dana Brown was selected as the 2017 SCORE Person of the Year. Filmed entirely in Mexico’s majestic Baja California peninsula, ‘Dust 2 Glory’ has chronicled each of the four races in the 2016 SCORE World Desert Championship as well as the 2015 SCORE Baja 1000. 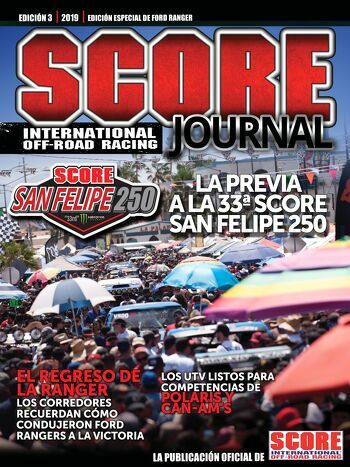 In addition to both the 2015 and 2016 SCORE Baja 1000 races, footage for the film also came from the other 2016 SCORE Baja races—the 30th SCORE San Felipe 250, the 48th SCORE Baja 500 in Ensenada and the Rosarito Beach 20th SCORE Desert Challenge. The documentary captures the spirit of SCORE Baja racing through many of the courageous competitors all on the colorful backdrop of Mexico’s magnificent, majestic Baja California peninsula and the Mexican fans of SCORE Baja racing who have embraced the sport so enthusiastically. Among the Cinepolis locations in Baja California, Mexico that will be showing ‘Dust 2 Glory’ are in Tijuana, Tecate, Mexicali, Rosarito Beach, Ensenada, La Paz and San Jose del Cabo. Some cities will have two showings the film twice each night. The Tijuana, Ensenada and Mexicali Cinepolis theaters are showing the film at 7 p.m. and 8:10 p.m. each of the three nights this week. Among the Cinepolis locations in Mainland Mexico that will be showing ‘Dust 2 Glory’ are in Acapulco, Cancun, Cuidad Juarez, Durango, Guadalajara, Hermosillo, Leon, Matomoros, Mexico City, Monterrey and Nuevo Laredo. Some cities will have two locations showing the film and Mexico City will have three—two in the central part of the metropolis and one in the southern part.